The word “saloon” conjures up images of the Wild West — gunslingers, honky-tonk pianos, can-can dancing, bar fights and libations. Cirque Eloize’s “Saloon” takes all of that in consideration and adds some acrobatics and live folk music in the mix. Audiences will get two chances to see “Saloon” when the Park City Institute present Cirque Eloize on Tuesday and Wednesday, Feb. 21 and 22, at the Eccles Center for the Performing Arts. The Park Record caught up with acrobat and musician Shena Tschofen, a performer with Cirque Eloize, on the phone this week to talk about the shows. The idea was then passed to the show’s director Emmanuel Guillaume. As with all Cirque Eloize performances, acrobatics are a big part of the productions. “I think acrobatics is a fun game to play with trust, because you have to trust your partner with your life,” Tschofen said. “I think all of us have this implicit trust in each other. Because Tschofen isn’t just an acrobat, she had an additional worry. Tschofen said she lucked out to be part of this particular cast. The group’s cohesiveness, however, doesn’t mean all the performances have been goof free. “There are some bloopers where things haven’t gone as planned, but we have been able to cover for it because there is always someone who is able to step in to help,” Tschofen said. “Saloon” is Tschofen’s first long-term touring contract outside of school, and Cirque Eloize has done nearly 100 shows since August. She said the experience has been eye opening. The biggest challenge for Tschofen is playing the music. The other challenge is one the whole cast faces. “We’re all on stage more than 80 percent of the show and what we do is really involved, so we all get really tired,” Tschofen said. If on-stage challenges weren’t enough, Tschofen had to do some off-stage adjustments. She also had to adjust her sleep schedule. “I like to get up early in the morning, but that doesn’t happen on tour,” she said with a laugh. “You finish a show at 10 o’clock at night and then you want to eat and you don’t got to sleep right away because you still have that adrenaline rush. Then there’s the idle time before a show. All of those concerns disappear when the performances or rehearsals start. “My main discipline is cyr wheel and my main goal was to do something with it that hasn’t been seen before,” Tschofen said. 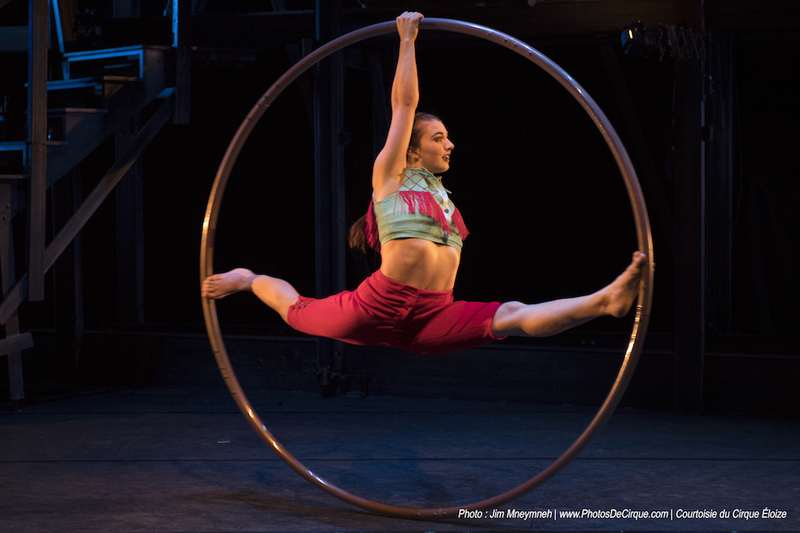 The cyr wheel is a large hoop that the performer uses to gyroscopically spin, twist and roll around on the stage. The music is another enjoyable element. “I never thought I would be able to do that, even though music has been a huge part of my life since I was very little,” she said. Tschofen started playing classical violin and doing gymnastics when she was 4. At 6, she began circus performing. Tschofen got accepted to the National Circus School in Montreal in 2013 and graduated in June. While performing is always a thrill, Tschofen enjoys the connection with the audience. Park City Institute will present Cirque Eloize, the Montreal-based performance group that blends theatrics, dance, acrobatics, music and fun, at 7:30 p.m. on Tuesday and Wednesday, Feb. 21-22, at the Eccles Center for the Performing Arts, 1750 Kearns Blvd. Cirque Eloize’s new show is called “Saloon.” Tickets range from $29 to $79 and can be purchased by visiting http://www.ecclescenter.org.